The OED is a pessimist. The word ullage assumes that the glass is half empty. I wonder if there is a word for the amount that half fills the glass? I just did a quick search for antonyms of ullage and found in several places that none exist. Perhaps I should make one up? How depressing that there is no positive counterpoint to this word. I was already having a bad day before this word. All I really want to do is eat one of those Pepperidge Farm frozen cakes with the frosting that comes off in perfect little sheets…and perhaps watch some of my favorite Bill Murray movies – Groundhog Day, The Life Aquatic, Rushmore, Lost in Translation, Caddyshack…this would be an awesome day. However, this is not the adult thing to do. I have a baby to care for and various household cleaning chores. One might say the glass of my day is half full of drudgery. So, glass half empty or half full. I think it depends on the glass and what is in it. A half glass of beer is half empty, while a half glass of vomit is half full. 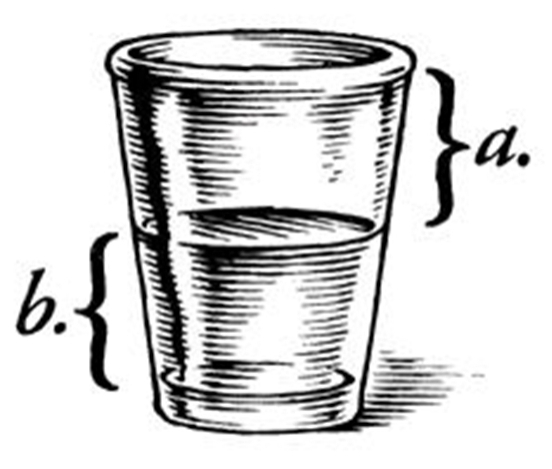 How funny that when a glass has something that I like in it, I see the void as negative while when it has something foul in it, I see the void as positive. Perhaps this makes me a glutton of some sort. I would be a better, happier person if I was satisfied with half a glass of beer – but I always want more. “…the moon was so beautiful that the ocean held up a mirror..” I start with one paradox and end with another.